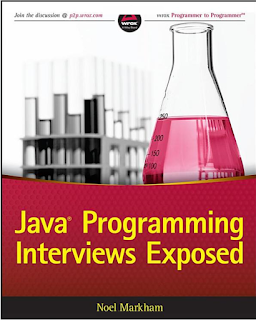 Though, if you are preparing for Java programming interview, you should also check out the Java Programming Interview Exposed, a great book specially designed to prepare for Java concepts based interview questions. It has many such questions from all important topics e.g. oop concepts, multithreading, collections, frameworks like Spring and Hibernate, unit testing, data structure and algorithm, coding, design pattern and modern technology questions like Android, Scala, and other JVM languages. 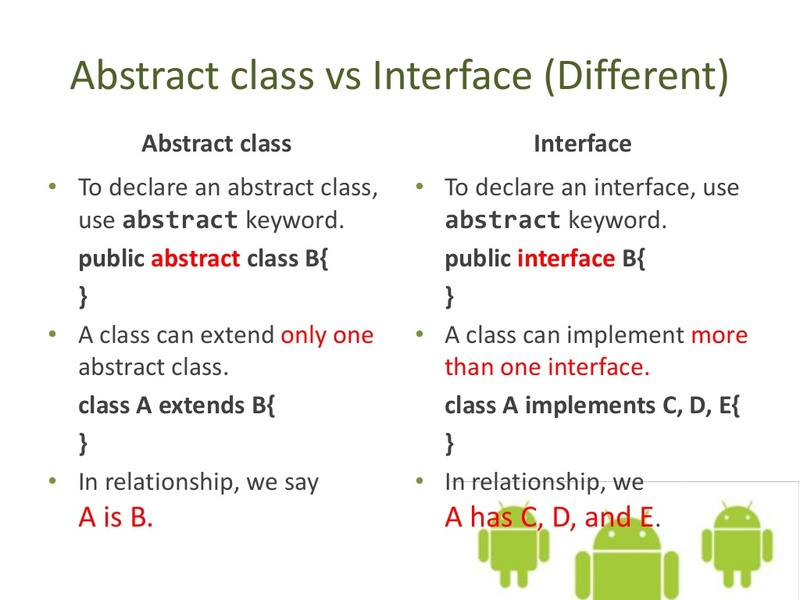 In the last section, we saw what is abstract class and interface and now let's see the difference between interface and abstract class in Java. 1) First and the major difference between abstract class and an interface is that an abstract class is a class while the interface is an interface, means by extending the abstract class you can not extend another class because Java does not support multiple inheritances but you can implement multiple inheritance in Java. 2) The second difference between interface and abstract class in Java is that you can not create a non-abstract method in an interface, every method in an interface is by default abstract, but you can create a non-abstract method in abstract class. Even a class which doesn't contain any abstract method can be made abstract by using the abstract keyword. 3) The third difference between abstract class vs interface in Java is that interface is better suited for Type declaration and abstract class is more suited for code reuse and evolution perspective. 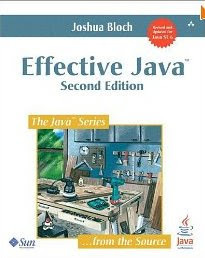 The Effective Java has one item dedicated to explaining about why you should be using interface for type declaration. You should check that out as well. 4) The fourth difference between abstract class and interface in Java is that abstract class are slightly faster than interface because interface involves a search before calling any overridden method in Java. This is not a significant difference in most of the cases but if you are writing a time critical application then you may not want to leave any stone unturned. 5) Another notable difference between interface and abstract class is that when you add a new method in existing interface it breaks all its implementation and you need to provide an implementation in all clients which is not good. By using an abstract class you can provide a default implementation for a new method in the superclass without breaking existing clients. That's all on the difference between abstract class and interface in Java, I will add more differences whenever I learn new things. As I said, in the first paragraph, after the introduction of default method in Java 8 (See Java 8 in Action) and the provision that you can have both static and default method inside an interface, the difference between abstract class and interface has become blur. Earlier, the interface only contains contract no implementation but now they can. i lerned very well by IT?????????? Thank u... It s very useful for me. 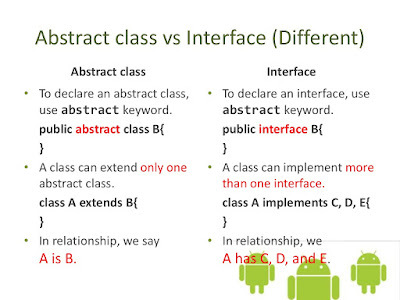 i don't understand where we use interface and where we use abstract class ? Use abstract class if you want to provide a Skeleton class e.g. AbstractList class from java.util package, while use interface to define public API e.g. List is an interface and AbstractList is an abstract class. The List allows you to use List in a flexible way and AbstractList allows developer to create a new implementation of List easily. 1. A class can implement more than one interface(Multiple Inheritance is possible with interface). But A class can not extend more than one abstract class(Multiple Inheritance is not possible with class). 2. If You want to add a new method in interface, you need to implement that method in all the classes that implementing the interface. But if you want to add a new method in abstract class, you can add it as a non abstract method. You don't need to implement it in all the classes that extending the abstract class. 3. Interface don't have constructors. But Abstract class has constructors. If we don't want to allow anybody to create the object to our class,then we should go for abstract class. Indeed, but that's the half of the story, you want others to extend your class before use, that's the meaning of abstract class e.g. your servlet should extend HttpServlet and implement doGET(), doPost() methods etc. @Anonymous, From Java 8 Onwards interface is not completely abstract i.e. they can also have code in form of static and default methods. That actually blur the difference between abstract class and interface but still you can implement multiple interface but only extend one class. @Anonymous, from Java 8 onward, interface can include static methods. Typo found, there in the picture, should read: "To declare an interface, use interface keyword". @Aulo, good catch, thanks for pointing out, indeed "interface" is the keyword to declare interface in Java. Can you please explain the real time scenario when we use interface and abstract class. I'm not clear with the answer given to Raman.